Welcome to Fort Gordon Disc Golf. The following information is provided for recreational players and as a way to introduce new players to the game of disc golf. For competitive players who want to use the official Professional Disc Golf Association (PDGA) rules, please visit PDGA.com. Disc golf is played like traditional golf, but with flying disc instead of balls and clubs. Players throw from the designated tee area to a metal basket. 1 point or stroke is counted each time the disc is thrown. The goal is to complete the hole with the fewest throws. 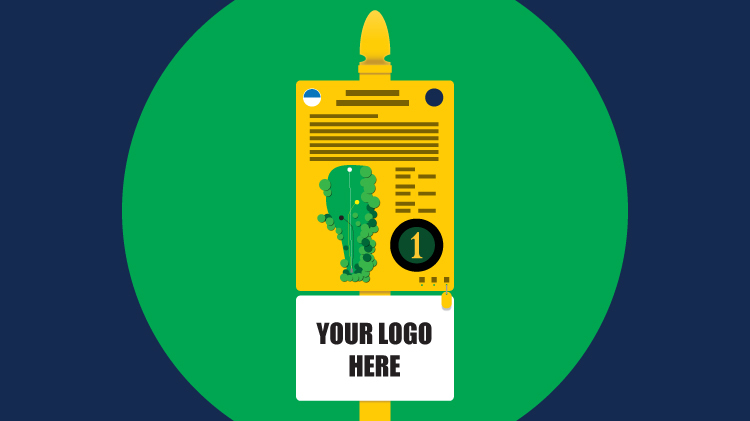 The layout, suggested route and par for each hole will be displayed on the tee sign at each tee box. Players begin each hole by throwing the disc from within the designated tee area. After taking the initial throw from the tee, advance toward the basket by throwing the disc along the fairway. The spot where the disc lands after each shot is called the "lie". The next throw is made directly behind the lie. If playing in a group, the player whose disc is farthest away from the basket throws next. You have completed the hole when your disc lands and stays in the basket. Crossing a sidewalk or landing in a parking lot or roadway is "Out of Bounds". Should your disc land in an out of bounds area, retrieve your disc and return to where the disc crossed out of bounds, mark a new lie one meter perpendicular to the hazard. The next throw is taken from this lie, with a 1 stroke penalty. Any additional designated "Out of Bounds" areas will be indicated on the tee sign for each hole with red and white lines. 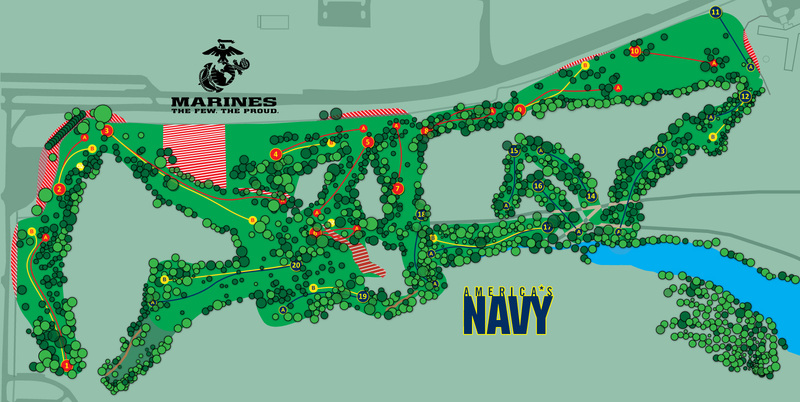 Course Design by James W. Meeks Jr. The Fort Gordon Disc Golf Course will be hosting series of leagues throughout the year on Saturday's starting at 11:45 a.m. for 10 week periods. Each league is sanctioned by the PDGA and PDGA rules are in effect. Most leagues will be sponsored by a major disc golf company with prizes based on your accumulative points. The league is open to the public. 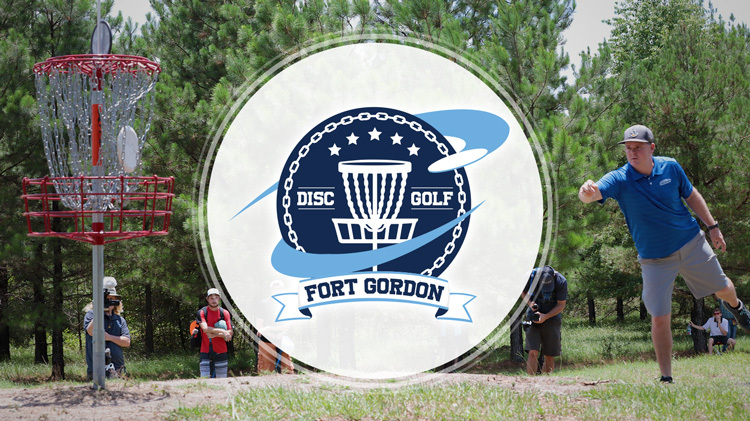 You don't have to be a member of the Fort Gordon Disc Golf Club to play or be a member of the PDGA, but is highly encouraged. You can join the club by contacting the Course Manager at +1(706)791-6433 or via email using the "Email Us" link at the top of this page – the cost is $20. To join the PDGA, go to www.PDGA.com. Children may play as well and they will be on the same card as the parent. The cost is $5 to play each week and Closet To The Pin (CTPs) will also be provided on selected holes. Please keep safety in mind at all times while on the courses. You will be in the woods with nature including animals, reptiles and insects. Bring plenty of water to carry on the course to stay hydrated and any other medical supplies you may need while away from your vehicle. In case of an emergency, you may contact the Tournament Director and medical assistance will be notified immediately. Please don't hesitate to ask any questions. Thank you for your support and enjoy your rounds. Never throw when players or trail walkers are nearby. Always give trail walkers the right of way. Remain quiet and avoid unnecessary movement while other players are throwing. Stand behind the player who is throwing until the throw is complete. Pick up trash and place in the proper receptacles (located at holes 1, 4, and 7). Dogs must remain leashed and owners must pick up and remove any droppings. Most importantly, have fun and come back to play again soon. I'm ready to play... now what? Do I have to use a special disc? Most players prefer to use discs designed for the game of disc golf. However, feel free to try the game with a regular Frisbee. Do I have to schedule a tee time? No, come play anytime. However, from time to time we will have leagues or tournaments that may close the course for open play. Nothing! 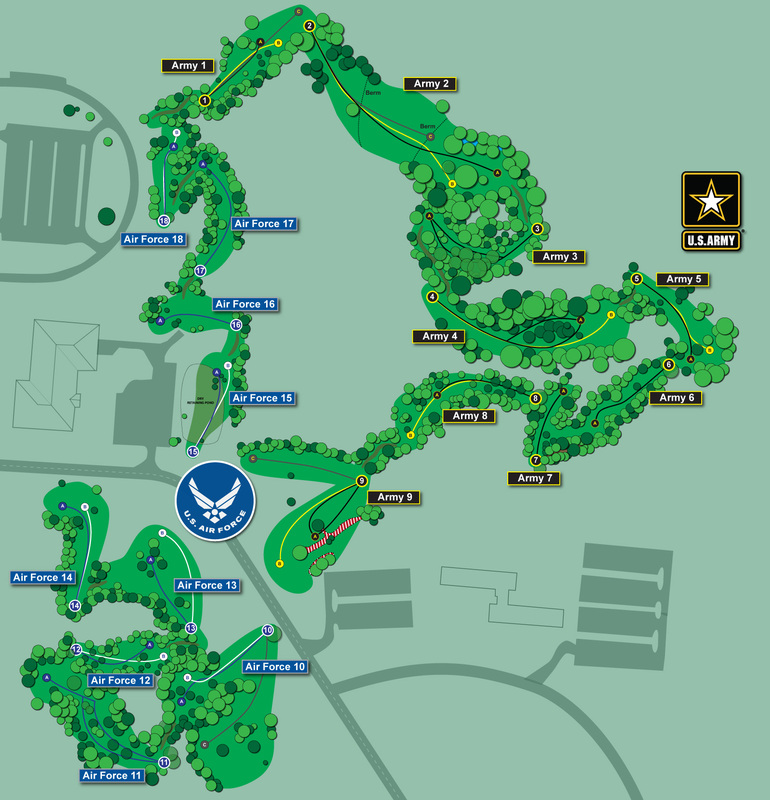 Playing the Fort Gordon Disc Golf Courses is free. What if I bring a large group? No problem at all. While you are allowed to play together we ask that you split into groups of 4 to 6 to speed up play. Remember to let other groups play through if they catch up to you. What if I lose a disc or I find one? Most people mark their name and often, their phone number or email address. Do the right thing and give them a call to return their disc. You might make a new friend along the way. Do you have scheduled tournaments or leagues? We will post information concerning league or tournaments on our Facebook page www.facebook.com/FortGordonDiscGolf or, here on this web page. What if I get an Ace? First – congratulations! An Ace is always a great accomplishment and a truly memorable moment. Let us know, we have an Ace pole at the entry to each course and we will make a dog tag to commemorate your achievement. Contact us by email using the "Email Us" button at the top of this page. What if I find a broken piece of equipment? Please contact us via email using the "Email Us" button at the top of this page.